Phyllis Bradford Jones of Blanding, Utah passed away at home January 20, 2019. She was 95 years old. 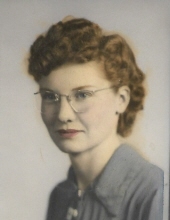 Phyllis was born April 1, 1923 in Blanding to George Leon and Britta Harvey Bradford. She was the second of five children. Phyllis married Wendell Palmer Jones on February 14, 1942 in Aztec, New Mexico. They were sealed in the Logan temple on July 3, 1946. Twelve children were born to Phyllis and Wendell. Following Wendell’s passing in 1991, she married Liddell Roberts in July of 1995. Phyllis was active in the LDS church. She served in the library, Primary, Sunday School, Relief Society, Cub Scouts, and for many years provided the sacrament bread and cloths. She sang in the choir into her eighties. Phyllis worked for nearly 19 years in the school lunchroom. The lunch ladies made delicious meals from scratch. Phyllis always enjoyed time with the family in the outdoors. She loved rides on the mountain, cooking in a dutch oven, hunting with the family, and looking for arrowheads. She had an amazing eye for spotting deer, arrowheads and pretty rocks. Phyllis was a dedicated gardener. She preserved much of the harvest for enjoying all year long. She made countless quilts and was a skilled seamstress, making clothes for her family. Phyllis had a wonderful singing voice and taught herself to play the piano. She is survived by her children Dale B. (Mary), Wendy (Butch) Halbritter, Georga J. McFarland, Taunya Jones, J. Kumen (Janice), Jeffrey W. (Tracy), Susan J. Runyan, Rachelle CJ (Miguel) Garcia, M. Blake (Deb), Terri R. (Kevin) Jensen, Clyde W. (Jennifer) Jones, Robert L.C. (Becky) Jones and her brother James Duke Bradford. She was preceded in death by husband Wendell, her sons Patrick Weldon Jones and Palmer Drew Jones, her second husband Liddell, and her brothers Garth, Harvey, and Bernal. She is also survived by 49 grandchildren and a growing number of great grandchildren. A celebration of a life well lived will held at the Blanding North Chapel on January 26, 2019. Burial will be at the Blanding cemetery. To plant a tree in memory of Phyllis Bradford Jones, please visit our Tribute Store. "Email Address" would like to share the life celebration of Phyllis Bradford Jones. Click on the "link" to go to share a favorite memory or leave a condolence message for the family.